The Sig Sauer 1911 Select features SIG's durable Nitron finish, SIGLITE night sights and custom G10 grips. The all stainless steel construction is machined to precise tolerances and hand-fitted for reliability. The frame features 25 LPI checkering and an extended beavertail safety. 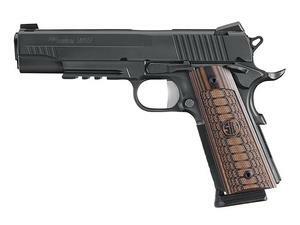 Like all Sig Sauer 1911 Select pistols, only premium components are used.